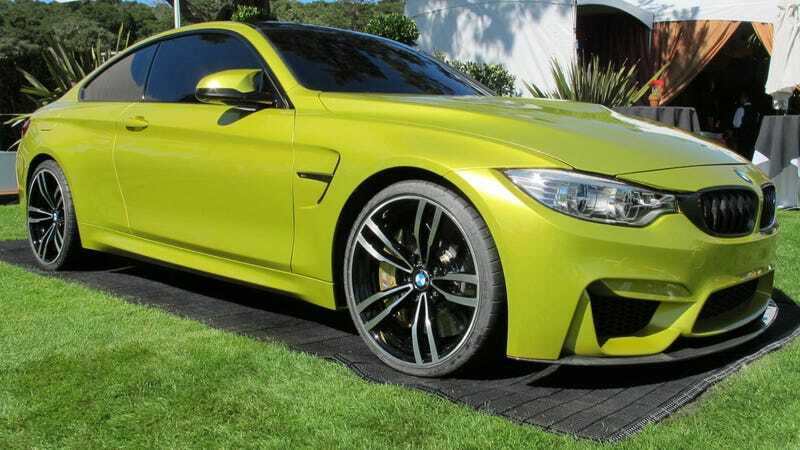 I know now it's become an internet cliche, but I really can't stop looking at the BMW M4 concept. BMW showed off the concept — which will arrive as the M4 — today at The Quail, A Motorsports Gathering. The Quail, which has become somewhat of a showcase for automakers' future cars, having hosted concepts from Lamborghini, Spyker and now BMW, has become a must-attend event for both the media and well-heeled luxury-car clients during Pebble Beach car week. Young designer Florian Nissl, who rose through the M design ranks — having worked previously on M Sport packages — penned the M4's exterior flourishes, including those double character creases that run along the rocker panels. The overall effect is an aggressively forward-moving design that never appears monolithic. You might say it splits the difference between the soft lines of the E46 and the angular of the E92 M3s, but that's only part of the design story. While the concept's paint job doesn't have the same green-brown overtones as the E46's much maligned Phoenix Yellow (for the record, I loved it), it does show off the car's many swage lines in pretty spectacular fashion, and emphasizes the chiaroscuro effects that give the sides pop in three dimensions. BMW isn't revealing any engine or interior details yet, but considering how extensive the concept's intakes are, it would be easy to assume talk of a turbocharged inline six 450 horsepower wouldn't be out of line. For now, just gaze upon it and enjoy.